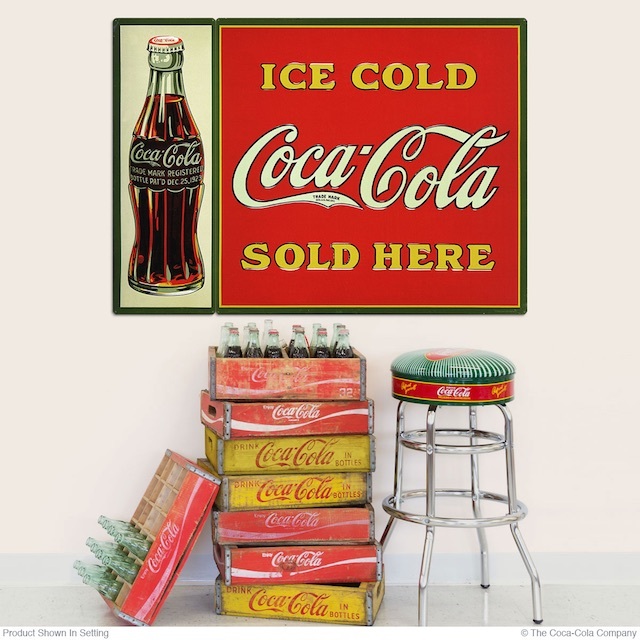 Invented in 1886, Coca-Cola was only first bottled in 1894 when Vicksburg, Mississippi soda fountain owner Joseph Biedenharn realized the brisk sales at his soda fountain meant there could potentially be a market for bottled Coke. He set up bottling equipment in his candy store and was soon able to start selling cases of Coke to farms and lumber camps on the Mississippi River. The first official bottling contract for Coca-Cola was granted to two Chattanooga, Tennessee lawyers in 1899. Benjamin F. Thomas and Joseph B. Whitehead successfully negotiated with Coca-Cola president Asa Candler for exclusive Coke bottling rights—for the price of one dollar. Candler let the rights go so cheaply because he was concerned about the ability of bottlers to maintain taste consistency from case to case. The first bottles used for Coca-Cola bottling were straight-sided green tinted Hutchinson bottles. From 1900 to 1916 bottles varied from bottler to bottler; they could be pale green, amber or clear glass. 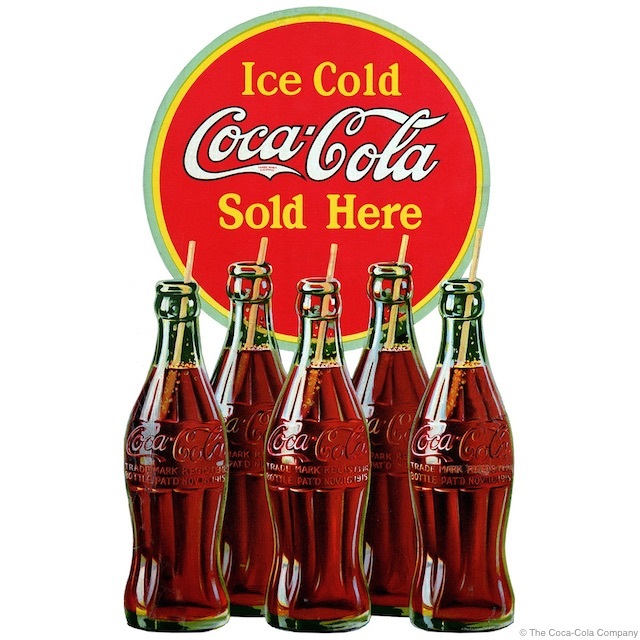 In 1906 a diamond shaped paper label was added to the bottles to try to discourage counterfeiters and so Coca-Cola could stand out among competitors of the popular cola. 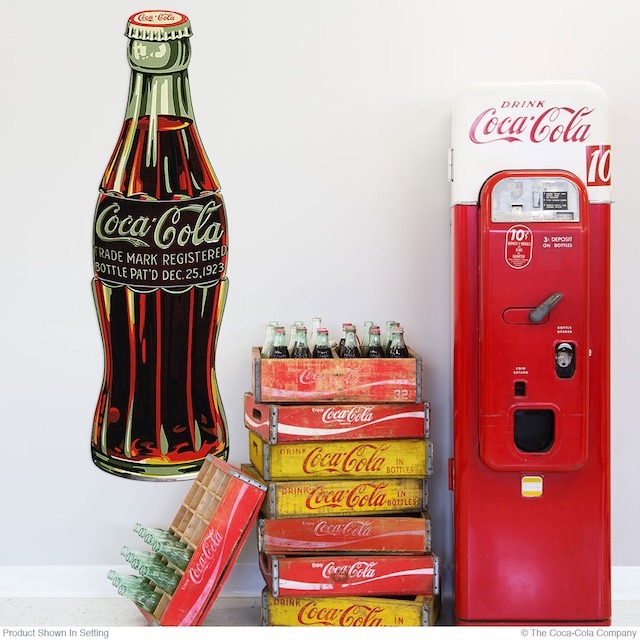 Within a few years, the Coca-Cola Company saw a need for a single unique bottle design to distinguish Coke bottles from all others. The Coca-Cola Company issued a challenge to bottlers to design a “bottle so distinct that you would recognize it by feel in the dark or lying broken on the ground.” The design chosen was produced by the Root Glass Company of Terre Haute, Indiana. As Coke legend has it, the shape of the bottle was inspired by the ridges on a cocoa pod. 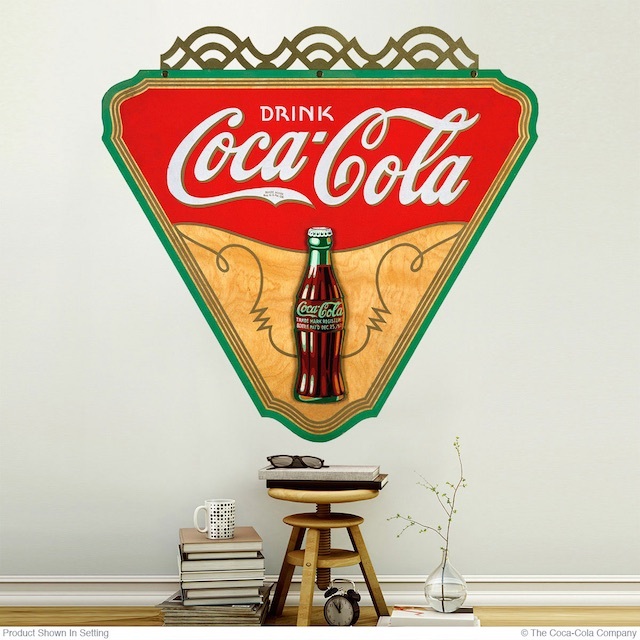 Coca-Cola didn’t contain cocoa, but the designer was unable to find images for kola nuts and coca leaves which the drink did contain. The contest-winning Coke contour (or hobble-skirt bottle), was patented on the 16th of November 1915 and were made exclusively in Georgia green glass. 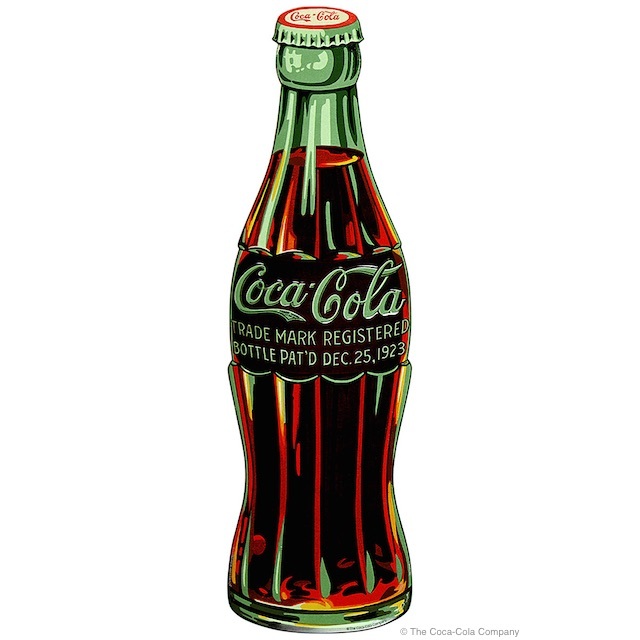 The patent of the original Coke contour bottle came up for renewal for the first time in 1923. The new mold design carried the patent date of December 25, 1923. Because of this, the bottles produced between 1923 and 1937 all bore this date and were known as Coca-Cola Christmas bottles. Although the date referred only to the date the bottle patent was filed, these bottles have become popular with collectors. 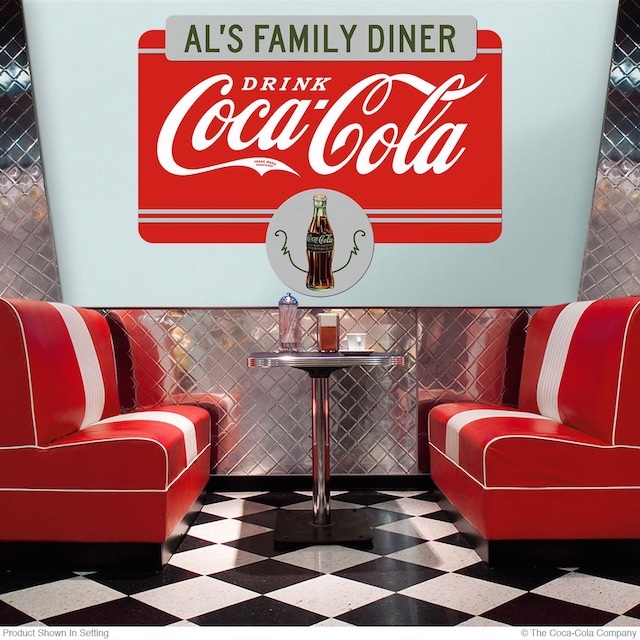 We have been granted a license by The Coca-Cola Company to reproduce many of their vintage advertising images. 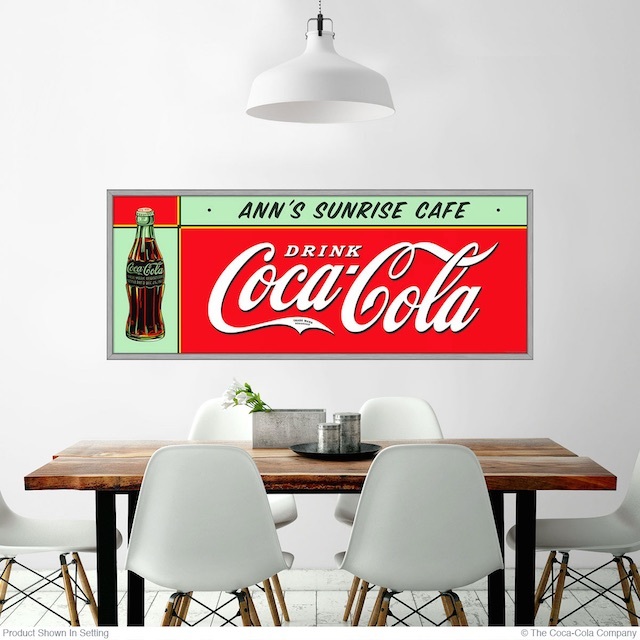 Access to Coca-Cola archival art has allowed us to reproduce beautiful Coke advertising that includes the Coca-Cola Christmas bottle on decals, signs, floor graphics and stickers. Now you can bring vintage style into your home or business—without having to pay high prices for vintage items. 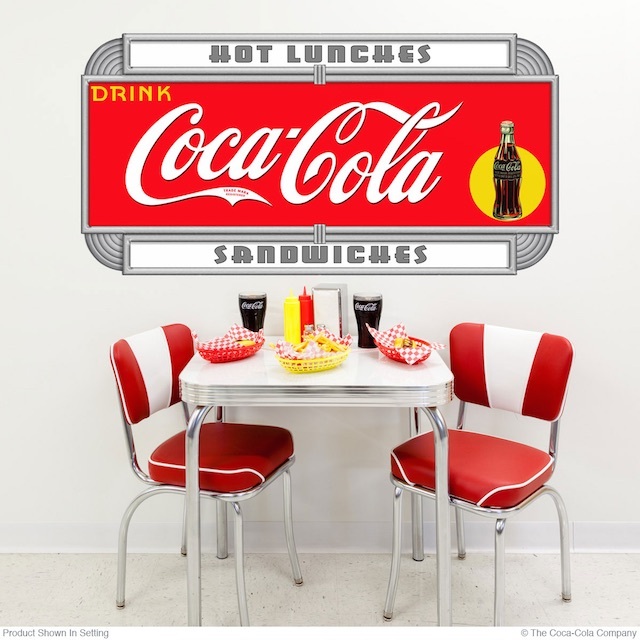 In addition to our wide selection of reproduction Coke advertising, there are many signs, wall decals and stickers that can be personalized with your name or business if you’re shopping for something truly unique. 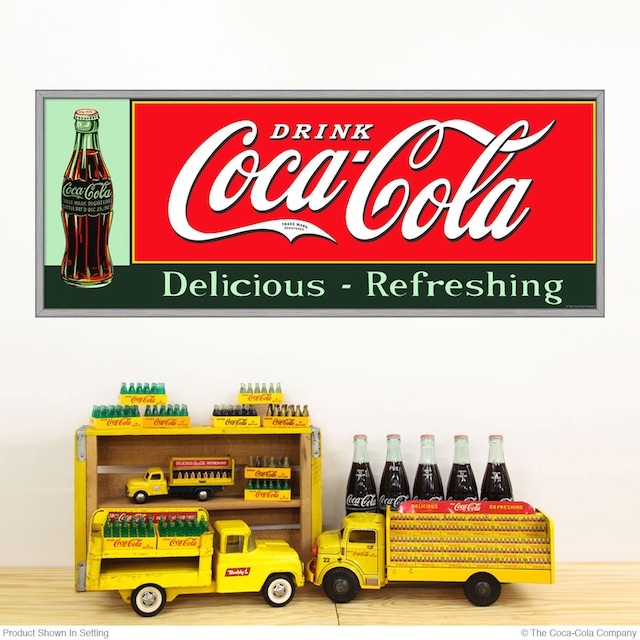 Be sure to click through to see all the wonderful Coca-Cola products we offer.